That is my drink! Hands off! First you shortchange me on the Klondike bars, now you go after my drinks – do you want another round of Torture DiNozzo Week? Right. Now that I have my drink back, we can resume probing the final frontier. Yes. I got Black Widow out of my system. But I have not gotten The Avengers out of my system. So don’t expect me to keep talking about Star Trek for the rest of the week. Come on, DiNozzo! This is what makes life interesting! Besides, this is my forum. I get to talk about whatever I want whenever I want. Anyway, back to my real reason for stopping by. One of the things that I noticed about Into Darkness is how Kirk handles the film’s two leading ladies: Lt. Nyota Uhura and Carol Marcus, Admiral Marcus’ daughter. In Uhura’s case, Kirk now respects her as a friend. He is no longer contemplating pursuing her, as he tried to in the first Star Trek movie. This makes sense; it would not be smart for Kirk to continue chasing her after she so obviously showed her preference for Spock in the previous film. One scene that I enjoyed from Into Darkness occurs after Kirk, McCoy, Sulu, and Uhura have returned to the Enterprise in one piece. It is the scene where the volcano Spock is attempting to stabilize begins to erupt. Kirk tries to find a way to safely beam Spock back to the Enterprise from the heart of the volcano, only to come up against numerous physical dead-ends. As the situation escalates, it is easy to see that Uhura is becoming overwhelmed by her fear for Spock’s life. When the situation reaches its crisis point, the one where Spock says, “The needs of the many outweigh the needs of the few,” Uhura nearly bursts into tears. Kirk looks at her, looks back at the screen, then asks what Spock would do if their positions were reversed. It is possible that Kirk said this to snap Uhura out of her emotional spiral, trying to get her to concentrate more on saving Spock than on the idea that she would never see him again. Whether or not that was the point, McCoy jumped into the breach and crassly suggested that Spock would let Kirk die. This is proved untrue later in the film, but we covered that in my post ‘Into Darkness,’ so I am not going to rehash it now. After Pike is killed and Kirk gets the Enterprise under him again, the brash young captain discovers that Uhura and Spock are having a fight. This shocks him. Actually, it is a bit of a surprise, because in the first film it was implied that Uhura and Spock understood each other very well and had a perfect system of communication. Not so much so in Into Darkness. I am with Kirk. What the heck is it like to be in a lover’s spat with a Vulcan? I would think it would be absolutely exhausting. In the end, of course, Uhura and Spock re-establish ‘communications’ and stop fighting. This is achieved on Kronos, of all places, when she and Kirk both express their disappointment with Spock’s attempt to switch off his emotions. Ironically, Uhura becomes upset at Spock for controlling his emotions in the volcano when she was fast losing her hold on her own feelings at the same time! Hollywood lovers’ spats – gee whiz! How dumb can it get? 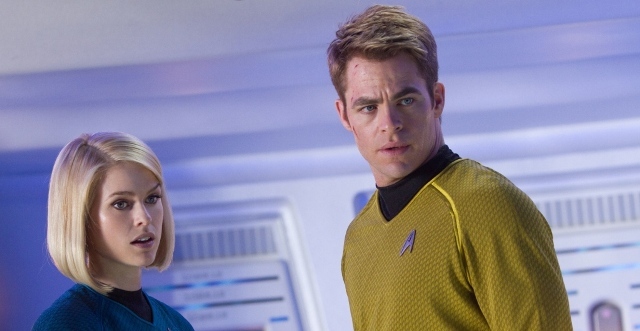 Still, I cannot get over Kirk’s attempts to calm Uhura down earlier in the movie. It is a well-performed scene that shows just how far their friendship has progressed since the first film; Uhura trusts Kirk enough that she will pay attention to him now, and Kirk shows here that he respects her. I guess it comes of the two of them having a mutual friend in Spock. That, and even starships are too small for people to completely avoid each other. Now we come to Kirk’s ‘friendship’ with Carol Marcus. From the minute he lays eyes on her, the audience can tell Kirk likes her. For her part, Marcus appears to totally blow him off. The last time someone blew Kirk off successfully, it was because they already had a boyfriend: Uhura studiously refused all of Kirk’s advances in Star Trek. This time around, though, Kirk has run into a lady who is very hard to impress. While Carol Marcus seems to think as highly of Kirk as he does of her, she still keeps him at arm’s length. Honestly, I think this may be one of the reasons he likes her so much. Carol shows more spark during Into Darkness than any of Kirk’s previous dates. This is established in the shuttle bay when, while discussing the torpedoes her father sent with the Enterprise with Kirk, she begins to get changed after telling him to turn around. Kirk’s regard for Carol grows throughout the film. When she and McCoy go down to the surface to inspect one of the ‘special’ torpedoes Admiral Marcus gave the Enterprise for this mission, McCoy accidentally triggers the weapon and gets his arm trapped in it. Although McCoy and the bridge crew urge Kirk to beam Carol aboard the Enterprise to safety, Carol strenuously argues that she be allowed to stay. And she is doing this as she frantically works to disarm the torpedo. Deciding to trust in the woman’s talents, Kirk is rewarded when Carol safely defuses the torpedo and frees McCoy. This scene shows her competence under extreme pressure; I would hate to think of how any of Kirk’s previous girlfriends would have reacted in the same situation. Later, Carol again proves her mettle when she attempts to convince her father not to annihilate the Enterprise, arguing that if he wants to destroy it, he will have to kill her with the rest of the crew. But while Admiral Marcus may be prepared to send the galaxy into the tailspin of war, he proves that he will not harm his daughter when he beams her aboard the Vengeance. Carol subsequently proves that she seems to have inherited some of her father’s stubbornness when she slaps him to show her contempt for his decisions. She may be his daughter but she’s still got a firm grasp on the principles he so deliberately tossed aside. Finally, Kirk shows how much he has come to respect Carol at the end of the film. When Kirk walks onto the bridge as the crew is preparing for their five year mission, he checks on each member of his command crew individually, finishing with Carol. Having lost his father when he was an infant, and more recently his father-figure, Admiral Pike, Kirk understands how Carol feels about her father’s death. When he speaks to her, Kirk makes his tone and words as comforting as possible. In this scene, he shows that he does not consider Carol Marcus as simply a friend, or even as a run-of-the-mill one-time date. He considers her his equal, a woman who can keep up with him no matter where he goes or what he does. And that shows just how much Kirk has grown during the trials he has undergone throughout Into Darkness. So where will it go from here? Beats me, Tony. But fingers crossed that the next movie is as good as Into Darkness. Yes, I want the next movie to be better than this one. But if I go in with my hopes as high as the Seattle Space Needle, I may end up disappointed instead of happy. So I will go in with my hopes small, and either come out with the same amount of satisfaction or with a mountain of satisfaction. It is much harder to for me to be disappointed this way. And you know what else, DiNozzo? It makes the movie all the more satisfying if it exceeds my expectations! This entry was posted in Movie Reviews and tagged Captain James T. Kirk, Carol Marcus, Leading Ladies, Movie Reviews, Nyota Uhura, Star Trek Into Darkness on November 25, 2013 by The Mithril Guardian. Yes, I am finally going back to Star Trek Into Darkness! I found it a very enjoyable movie. It strikes me as more ‘Trekian’ than the previous J. J. Abrams’ Star Trek film. I think this is because of the details added to this movie, which I listed way back in my post ‘The Little Things.’ Then there are all the little character touches added to the “Enterprise Seven” – but we’ll get to those another time. Have you ever seen that picture – you know, the one of a snake eating its own tail? Yeah, that one. Do you know what it symbolizes? I believe it shows the folly of evil. Evil is like a snake eating its own tail; it is self-defeating. How long can the snake survive when it is consuming itself? Not very long, I would think. During Into Darkness, Kirk and Spock are thrust into the depths of loss and extreme pain. Kirk sees the man he has come to respect as a father, Admiral Christopher Pike, murdered. We all know that Kirk is no stranger to death, but this is the first time (that the audience sees) when he has watched someone close to him die. And it tears him up. Spock also gets thrown down this well. He mind melds with Pike as the old captain dies, experiencing again the emotions he felt as he watched his home world Vulcan annihilated (seen in the previous movie) – emotions he is desperately trying to avoid ever feeling again. As he later learns when Kirk ‘dies,’ he may as well quit breathing. Emotions do not have an off switch; they only rule a person who does not make them subservient to reason. In the case of Star Trek’s ‘dynamic duo,’ both Kirk and Spock come to the brink of the abyss of evil. At this threshold, they have a choice: fall or fly. What I mean by this is that they have a choice between good and evil. Will they give in (fall) to their “anger,” and their “fear,” (thank you, Master Yoda) and hatred? Or will they let these emotions go and rise (fly) above them? The two come very close to falling. Kirk first single-mindedly hunts down Khan to get vengeance for Pike’s murder, only to learn that he has endangered his whole crew when Admiral Marcus arrives to “tie up loose ends.” Kirk’s desire for revenge then appears to transform into a death wish, which is finally overcome when he chooses to sacrifice himself to save the Enterprise – and San Francisco. Speaking of which, they pick on Marvel for wrecking New York City every few months. J. J. Abrams has now attempted to destroy San Francisco twice, and I haven’t heard anyone complain. It is after Kirk’s ‘death’ that Spock reaches his precipice. Since Vulcan’s destruction, Spock has decided that he wants to feel nothing before he dies. Vulcans, as every Star Trek writer enjoys reminding the audience, feel far more deeply, passionately, and keenly than humans do. Giving in to his rage, pain, and the fear of being without his best friend for the next fifty of his two hundred years (the average lifespan of a member of the Vulcan race), Spock pursues Khan through the streets and airways of San Francisco. Even Spock’s vaunted Vulcan strength does not give him the upper hand against the genetically engineered Khan. Only when Uhura arrives and begins firing on Khan is Spock able to pin him. At which point he begins beating the villain with a piece of the freighter the three are riding on. I suppose Spock might have eventually killed Khan. But when Uhura manages to get it into Spock’s rage-benumbed mind that Khan can save Kirk, Spock pauses. The viewer can see by the expression on Spock’s face that he is very tempted to simply finish Khan on the spot. Even dead, his blood might have saved Kirk. But Spock does not kill Khan. He rises above the brink of evil. He takes the handle from the freighter and knocks Khan out in one smooth blow. Very cute move; I hope he did it hard. Subsequently, Kirk is revived to become a stronger, less cocky (maybe…), starship captain. He has seen evil again, not just outside of him but inside as well. And he has defeated that blackness every human has in their heart. He hasn’t permanently wiped it out, but Kirk has withstood this siege and won. Spock similarly stands stronger than he did at the beginning of the film. Having come to understand that emotions are without an on/off switch, he accepts the position they hold in his being and moves on with his friends. This triumph is in stark contrast to the movie’s two antagonists. I will begin with Admiral Marcus. When Marcus arrives to destroy the Enterprise (commanding a ship named – surprise, surprise – Vengeance), we learn that he has been preparing Starfleet for war underneath the public’s and the politicians’ noses. Marcus has distorted Starfleet’s mission; instead of seeing the Fleet as a force for peaceful exploration, and defense if the explorers’ way of life is threatened, he sees it as a war machine. Very typical of the military/industrial complex Hollywood enjoys harping about. That aspect aside, Marcus has ‘fallen’ Into Darkness. He is planning, the Enterprise crew and the audience learn, to start a war with the Klingons. His excuse for doing this? War is coming anyway. The Klingons are preparing for it; so should Starfleet. To make certain the Federation has the upper hand in this coming, glorious battle, Marcus has awoken the twentieth century menace Khan Noonien Singh. And, much like the sorcerer who summons a demon to devour his enemies for him in old fairy tales, Marcus himself is destroyed when Khan turns on him. For his part, Khan has also ‘fallen’ Into Darkness. But he has been sailing that black sea far longer than Marcus. A genetically enhanced human who wrought havoc on earth during the Eugenics’ Wars (in Star Trek history, this took place in the 1990’s); Khan and his remaining seventy-two crewmembers look down on all non-enhanced people as inferiors. In a way, this was what always made Khan so pitiable. Khan was a brilliant man who could have done great things but instead let his pride run amok, as it does here. You know what they say about pride going before a fall. Through Into Darkness, Khan gives viewers a good idea of what it is like when someone bows down before the all-consuming fire of pride. And in the three hundred and some years since he fell to his knees before it, Khan has lost all of the humanity he ever had, demonstrated when he brutally breaks Carol Marcus’ leg and then kills her father – right before her eyes. Now, I know I have sounded extremely (cough) dark here, so I will try to end this on a happier note. I think that the best way to do this is to make a small mention of the ending for the film. At the end, Kirk gives the eulogy at a funeral; I believe it is Admiral Pike’s. His words do not mean very much (until he recites the familiar lines from ‘Space, the final frontier…’). What does mean a great deal, however, are the images that accompany his speech. The day of the funeral is overcast, justly somber as the Federation mourns its dead and those who died to pride (Admiral Marcus). Meanwhile, other members of Starfleet are shown putting a re-iced Khan and his remaining crew in deep storage, away from even the misty grey of a sad day. In a way, Khan and his people are also being buried. Oh, they are alive in their stasis pods, their bodies still function. They are not physically dead. But if the other seventy-two are anything at all like Khan, they are dead spiritually. So although they are technically imprisoned in dreamless sleep, in effect they are being entombed the same way that any actual dead men would be. Meanwhile, Kirk and his crew still walk, talk, and feel; they are very alive despite the pain they have all experienced in this ordeal. And they get to go on living. They get to go on the famous, five year deep-space mission. They get to walk among the stars. That’s more than Khan will get to do for a long, long time. All because he gave in where others resisted. Maybe that was not a particularly chipper ending to this note, but it is the best I’ve got at the moment. I will try to do better next time. This entry was posted in Movie Reviews and tagged Admiral Marcus, Captain James T. Kirk, Khan Noonien Singh, Movie Reviews, Mr. Spock, Pain, Pride, Star Trek Into Darkness, Suffering on October 6, 2013 by The Mithril Guardian. There’s my Klondike bar! Mm-mm! That was it? Don’t they carry bigger bars in the squad room vending machines? Special Agent Anthony DiNozzo, if I find out that you’ve been short-changing me, I am going to make your next week a royal pain!!…. You HAVE!! I knew it! I KNEW it! You HAVE been buying the smaller bars! Oh, no, you aren’t getting away that easily! I’ve had something special in mind for you for the past few weeks. Now I get to give it to you. But while I’m plotting my vengeance, we’ll turn to the topic at hand. What do I mean by the little things? I mean all the cute little touches that J.J. Abrams managed to cram into Star Trek Into Darkness, the sequel to his first Star Trek revamp. One of the big things (unfortunately I had to have this pointed out to me) is that everyone at Starfleet Academy is going around ‘covered’ in this film. Come on, DiNozzo! You work for NCIS and somehow forget what covered means?!? Oh, any excuse. Yes, I do mean that everyone in the film, when they aren’t on the ship, is wearing a hat. In Navy terms, they are ‘covered.’ It’s a very nice touch that adds authenticity to the movie, like a scene in the first Star Trek film. When the U.S.S. Kelvin is adrift after the Narada’s first bombardment the captain and George Kirk head to the shuttle bay as the captain prepares to meet with Nero. On their way they pass a woman in a blue officer’s uniform. She stops heading down the stairs, turns to attention, and stays that way until the captain has passed. It was a very nice touch, but not quite as good as the sequel with everyone wearing a hat. On another note, Into Darkness sees Chekov assigned to Engineering. He gets told to “Put on a red shirt.” Our favorite navigator swallows nervously at the idea of the responsibility Kirk has just handed him. Meanwhile, the audience swallows anxiously at the idea of him wearing a red shirt. After all, most of the casualties in the original Star Trek series were guys wearing red shirts!! Fortunately, Chekov survives the experience. This notable trait of Star Trek is reversed sometime later in the film. Kirk’s old sparring partner, ‘Cupcake,’ and his companion are told to exchange their red shirts for trader uniforms. This may be the reason they survive the film. I wonder if they’ll live through the third one? I’m not making any bets with you, you cheapskate!! You’d probably run off with all the money. Besides, betting on Hollywood is harder than betting on the weather – at least it is when you’re dealing with good movies and their sequels. One of the other details I noticed was that the trouble on Starfleet’s doorstep began in London. How appropriate – the actor who plays Into Darkness’ villain is Benedict Cumberbatch. Not only is the man British, he happens to be playing England’s best loved detective, Sherlock Holmes, in a BBC series titled Sherlock. He also plays Smaug and the Necromancer in The Hobbit films alongside his Sherlock co-star and fellow Englishman Martin Freeman, a.k.a. Bilbo Baggins (Watson in the BBC series). Speaking of Into Darkness’ villain, he’s called Khan. Early on in the film he goes by a different name, but eventually he drops it. When he tells Kirk, Spock, and McCoy his history he mentions that Admiral Marcus (the secondary villain in the feature) found his ship adrift in space and woke him, holding the rest of his crew hostage to force him to cooperate. In the original series, Khan’s ship was named the S. S. Botany Bay. The name was that of a penal colony near Botany Bay, Australia, in the 1800’s and should have been a warning sign to Kirk, who was an historian. Another noticeable homage to the series was McCoy’s experiment on a dead Tribble. Anyone who has ever seen the original Star Trek episode “The Trouble with Tribbles” recognized that this overgrown plush puff would be important later on. The Tribbles have enjoyed fame in Trekdom since their introduction, producing a sequel adventure in the animated show of Star Trek that aired after the live-action series was canceled. The episode was so popular they even had the crew of Star Trek: Deep Space Nine revisit the episode. You ought to watch that one, it’s amazing. Then there’s this line of Spock’s early on in the movie, “The needs of the many outweigh the needs of the few.” This weighty Vulcan maxim first saw the light of day in Star Trek II: The Wrath of Khan. In that same movie, Spock went the extra mile to make sure the Enterprise was saved, despite the protests of Scotty and McCoy. This leads up to the most serious detail added to Into Darkness. Spock’s death scene is revisited in the film, but with a twist. 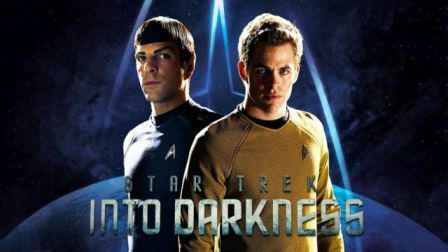 Into Darkness sees the role reversed, with Kirk the one who ‘sacrifices’ himself to save the Enterprise. Whew, that’s it; we’re done with the serious stuff. After Kirk comes back – you didn’t really think that they would let him stay dead, did you, Tony? – McCoy tells him not to get a fat head. “You were only mostly dead,” he adds. The Dread Pirate Roberts sails again!! If this isn’t a nod to The Princess Bride, then I don’t know what is!! Also mentioned in the film is Nurse Christine Chapel. Carol Marcus mentions her in one scene when speaking with Kirk, saying that, “She’s a nurse now. She’s very happy.” Kirk, apparently, had a fling with her between the films and has totally forgotten the woman. In truth, I can’t blame him. Nurse Chapel was one of the drippiest characters to ever walk onto the original Start Trek’s platform. In the series she had a crush on Spock that was never reciprocated. It led to a lot of embarrassing, unnecessary scenes in several episodes. That’s not to say that I have anything against Majel Barrett, the actress who played Chapel. She’s a good actress. She just got stuck with a lousy part and had to make the best of it. Another touch that harkens back to the original series is the regularity with which Sulu is handed the con (command of the ship). Well, your brain blipped into Neverland when I talked about the characters being covered. How could I be sure it wouldn’t happen again? So I’m going to spell out all navy references to you, just to be sure you understand! The fact is that Sulu gets to command the Enterprise several times in the film as Kirk and Spock run around saving Starfleet. In the original series and movies, this led to him becoming the proud captain of his own ship, the ‘newfangled’ (Scotty’s polite opinion) Excelsior. Sulu also gets a little extra characterization when he eyes his new navigator. Sulu was known in the series as a dashing flirt and could be found looking Uhura over a few times. This came to a head in the episode Mirror, Mirror, but not in a way either the original Sulu or the original Uhura would have wanted. The last and greatest touch to the film is the oft mentioned “five year mission.” Early in the show Kirk expects to be handed this fantastic five year deep space exploration mission, only to have Spock’s honesty keelhaul the idea. At the end of the movie, though, Kirk gets his wish. 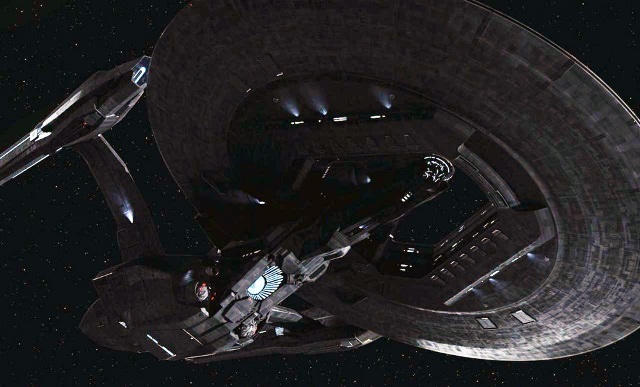 Starfleet commissions the Enterprise for her iconic five year mission. And if ever a ship was prancing like a thoroughbred at the starting gate, it would be Kirk’s Enterprise. The ship, by all accounts, left dry dock itching to warp into the unknown. Now she’s going and there’s no holding her back. Which means MORE movies!! Well, time for me to leave. And begin my evil plans. Beg all you want, DiNozzo!! There is no escaping my wrath. You are so going to regret cheating me of my rightful Klondike payments. This entry was posted in Movie Reviews and tagged Captain James T. Kirk, Movie Reviews, Mr. Spock, Star Trek Into Darkness, The Little Things, Trekian, trekkers, trekkies, U.S.S. Enterprise on August 16, 2013 by The Mithril Guardian.